Connect an eLearning store to your website and start selling online courses today! 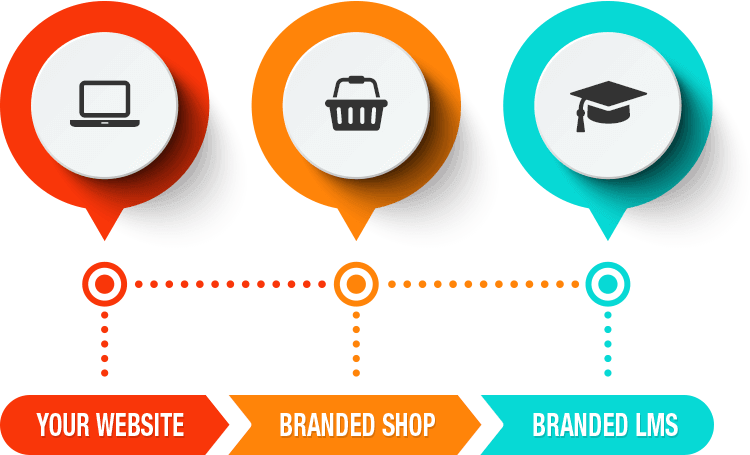 The Ecosystem Shop is a fully integrated e-commerce and LMS solution, driven from your website. It provides instant access to an automated e-commerce revenue stream and allows you to offer a portfolio of training products to your customers in a seamless, branded experience. For many businesses, the costs and expertise required to sell and manage eLearning can be prohibitive. The Ecosystem Shop allows you to plug in this capability without extensive development effort. Monetize your existing courses and switch on a new stream of revenue driven through your own website. Monetize your existing training courses and switch on a new stream of revenue driven through your own website! Sell training in over 135 currencies and take payment using all major payment methods! Created with the latest technology, the Ecosystem Shop automatically calculates the correct tax rate for the region, so you can comply with international tax authorities. All aspects of the customer journey can be white-labelled to your unique specifications. This allows you to provide your customers with a seamless user journey, from landing on the website, to purchasing on the shop and then taking the course on the LMS. Setup requires minimal investment and no technical expertise. You receive funds directly from the customer and have full account control. The shop is built on a secure platform that complies with industry standards such as PSD2, PCI-DSS, GDPR and MOSS VAT. We are proud to have developed an award winning, accredited training portfolio that certifies thousands of students each year. Your own branded market-leading LMS platform where your students can access their courses and share knowledge. Free of charge! Increase your Service Portfolio and customer base by creating a brand new revenue stream for your business without any cost!